BACKGROUND AND PURPOSE: Behçet disease (BD) is a multisystem vasculitis of unknown origin in which neurologic involvement has been reported in the range of 5% to 10% in large series. Reports on clinical and radiologic aspects of neuro-Behçet syndrome (NBS) are in general limited in number. Our purpose was to determine the MR patterns in patients with NBS who had neural parenchymal involvement and to correlate our findings with possible vascular pathophysiology. METHODS: The MR images of 65 patients with NBS and neural parenchymal involvement were reviewed. In a subgroup of patients who had serial MR studies, we evaluated the anatomic-radiologic location and distribution of the lesions and whether they corresponded to any vascular territory, and studied their extension, enhancement patterns, and temporal course. RESULTS: The most common imaging finding in NBS patients who had neural parenchymal involvement was a mesodiencephalic junction lesion with edema extending along certain long tracts in the brain stem and diencephalon in 46% of the patients. The next most common location of involvement was the pontobulbar region, seen in 40% of the cases. Three primary cervical spinal cord lesions and one case of isolated optic nerve involvement were observed. CONCLUSION: The parenchymal distribution of lesions in NBS appears to support the hypothesis of small-vessel vasculitis; mainly, venular involvement. The anatomic distribution of intraaxial veins of the CNS explains the predominant involvement of the brain stem structures observed in our patients. This pattern of lesion distribution might help to differentiate NBS from other vasculitides as well as from the inflammatory-demyelinating diseases of the CNS, such as multiple sclerosis. Behçet's disease (BD) is a multisystem vasculitis of unknown origin. The classical triad of oral and genital ulcerations with uveitis was originally described by a Turkish dermatologist Hulusi Behçet in 1937 (1). Other structures reported to be involved through the course of the disease are the cardiovascular, CNS, pulmonary, and gastrointestinal systems (2–4). Early neuroimaging reports on neuro-Behçet syndrome (NBS) were based on studies done with either CT or, rarely, cerebral angiography. To our knowledge, the largest series in which neuroimaging findings were based on CT studies were those reported by Inaba (5), in which 63 patients were examined, and by Siva et al (6), who described the findings in 42 patients with NBS examined at this institution. With the introduction of MR imaging in clinical practice, articles reporting the MR findings in NBS have appeared; however, most of these are limited to either single cases or to relatively small series (7–11). The most common CNS findings reported in these studies, including ours, were a preference for brain stem–diencephalic involvement and a tendency to resolve over time. Cerebral venous thrombosis is another common neuroimaging finding reported in NBS (12). In this study, we included only NBS patients who had CNS parenchymal involvement on MR imaging studies in order to define the MR patterns of this form of the disease and to correlate those findings with the results of vascular anatomic-pathologic investigation. Sixty-five consecutive patients with neurologic symptoms caused by BD and with CNS parenchymal involvement on MR images were included for evaluation. All patients were referred from the Behçet's Disease Research Center of our university hospital. Criteria established by the International Study Group for Behçet Disease (13) were used for diagnosis. Neurologic involvement was evaluated and defined by the neurology consultants of the Research Center from the department of neurology, who referred the patients for MR examination. Sixty-three patients had fulfilled the criteria for BD before the onset of neurologic involvement and two at the time of neurologic involvement. The study period ranged from January 1, 1990, to December 31, 1997. The patients included 18 women and 47 men, ages 19 to 51 years (mean age, 36 years). Patients with normal MR findings (21 cases) and with isolated dural sinus thrombosis (13 cases) were excluded from the study, because our primary goal was to evaluate parenchymal involvement. In 48 cases (74%), a 1.0-T MR imager was used, whereas the remaining patients were studied with different MR systems, ranging from 0.5 T to 1.5 T, as some patients had been examined prior to the time of consultation. The imaging was assumed to have been done in the acute stage if the patient was studied within a week of the onset of the neurologic episode or subacute if within a month. MR studies consisted of sagittal and axial T1-weighted spin-echo (SE) sequences and coronal and axial proton density–or T2-weighted fast SE sequences with 3- to 6-mm contiguous sections over the whole brain. Additional cervical spinal cord examinations with sagittal T1- and T2-weighted SE and axial T2-weighted fast SE sequences were performed in three patients, because their clinical picture suggested cervical spinal involvement. A section thickness of 3 mm was used for spinal cord examinations. Contrast material was used in 11 cases. Twenty-three patients underwent follow-up MR examinations (more than one follow-up in eight cases). The distribution of the lesions and whether they corresponded to any vascular territory, their extension and enhancement patterns, as well as the temporal course in the subgroup of 23 patients with serial MR examinations were studied and classified. The mean age of onset of neurologic symptoms was 26.8 ± 7.6 (SD) in patients with BD and 30.2 ± 8.5 for those with NBS. The male to female ratio was 2.6 to 1.0, showing a clear male preponderance. Fifty-two (80%) of the patients were examined in the acute/subacute phase and 13 (20%) in the chronic phase. Six patients (9%) had a primary-progressive course and nine (14%) had converted to a secondary-progressive course at the time of their MR study. The remaining patients, who had either a single attack or a relapsing-remitting form of the disease (77%), were studied during such an episode. Symptoms at onset in the order of frequency were headache, 85%; weakness, 57%; brain stem and/or cerebellar involvement, 50%; cognitive and behavioral disorders, 16%; and disorders of consciousness, 7%. A total of 94 lesions were identified in the 65 patients. The most commonly affected region was the mesodiencephalic junction (MDJ), seen in 30 patients (46%), followed by the pontobulbar region in 26 (40%), the hypothalamic-thalamic region in 15 (23%), the basal ganglia in 12, the telencephalon in five, the cerebellum in three, and the cervical cord in three (Table 1). There was no difference in the distribution of lesions between the acute/subacute or chronic phases. Of the 30 MDJ lesions, 11 showed a marked upward extension involving the diencephalic structures and 18 had a prominent downward extension involving the pontobulbar region. In six, the extension was both upward and downward (Fig 1). In a single case, studied in the chronic stage, the MDJ lesion was isolated, suggestive of a sequela. A, Coronal T2-weighted image (4000/90/2 [TR/TE/excitations]) at the level of the crus cerebri nicely shows heterogeneous left MDJ lesion with extensive edema, sparing the red nucleus. B, Coronal noncontrast T1-weighted image (300/15/3) at the same level as A reveals a hemorrhagic focus in the lesion. C, Coronal T2-weighted image (4000/90/2) posterior to A shows extension of perilesional edema caudally to the superior cerebellar peduncle and pontine tegmentum, and upward to the white matter of the temporal lobe, external capsule, and thalamus. D, Caudal extension of the edema toward the pontine tegmentum is seen on axial T2-weighted image (4000/90/1). E, Two years later, after another relapse of the disease, coronal T2-weighted image (4000/90/1) reveals a contralateral MDJ lesion. The left-sided lesion now has shrunk to a small hypointense area. F, Contrast-enhanced T1-weighted image (660/17/1) shows enhancement of the new right MDJ lesion. 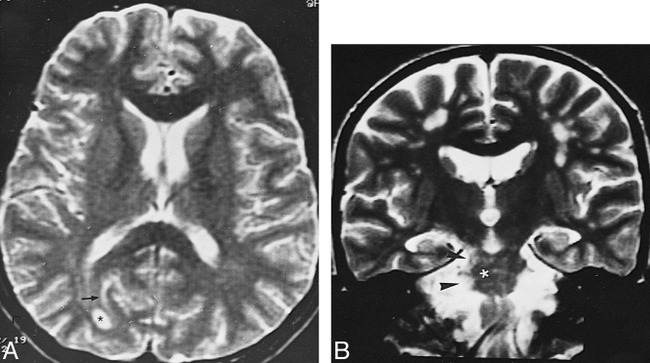 G and H, Similar extension of edema as observed in C and D is seen in the right mesencephalopontine region of the brain stem on T2-weighted images (4000/90/1). Of the 26 lesions with pontine and bulbar involvement, three had no association with other lesions (Fig 2). Twelve were associated with tegmental and superior cerebellar peduncular extension, and six showed corticospinal tract involvement in continuity with an MDJ lesion. In one patient with additional telencephalic lesions, the right side of the pons was hyperintense on long TR/TE images that did not cross the midline, suggestive of an arterial lesion (Fig 3). In two patients with pontine tegmental lesions, there was an associated middle cerebellar peduncle and deep cerebellar white matter involvement (Fig 4). Two others had associated cervical lesions. Axial T2-weighted image (2400/110/2) shows inhomogeneous hyperintense lesion located in the mid pons. fig 3. Axial T2-weighted image (2400/110/2) at the pontine level shows a right-sided pontine lesion that does not cross the midline. Cervical cord lesions were seen in three patients. They were predominantly located in the posterolateral part of the cord, continuing over at least two vertebral segments, with a tendency to reach the inferior cerebellar peduncles superiorly (Fig 5). One of them also had concomitant MDJ and pontobulbar region lesions. Of the 12 patients with basal ganglia and/or capsular lesions, one patient had involvement of the caudate nucleus and the adjacent anterior limb of the internal capsule without any other parenchymal abnormality. In the other 11 cases, the posterior limb of the internal capsule alone (n = 4) or together with the external capsule and putamen (n = 3) or with the globus pallidus (n = 4) were affected. In all 11 of these patients, additional MDJ and/or thalamic-hypothalamic lesions were also found. 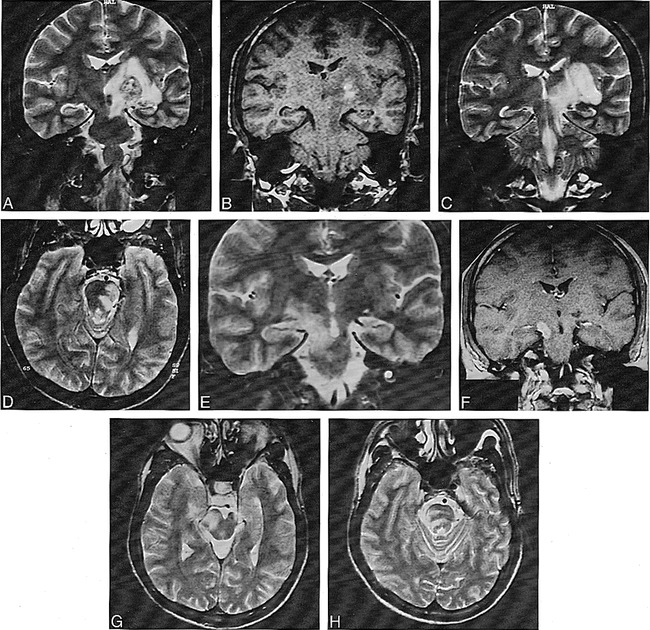 Telencephalic lesions were seen in only five patients (8%) and had a wide asymmetric distribution within the brain, involving the optic nerves and the subcortical and deep periventricular white matter (Fig 6). In the patient with optic neuropathy, the only finding was right optic nerve enhancement. In the other four patients, the hemispheric lesions were located in the subcortical and deep periventricular white matter without cortical involvement. These patients also had concomitant MDJ lesions, and, in one, wallerian degeneration of the optic radiation was observed in association with primary MDJ involvement (Fig 7). Two patients had prominent periventricular central atrophy, and four patients had asymmetric brain stem atrophy. All these patients had long-standing NBS. A, Axial T2-weighted image (3500/90/2) shows a well-defined deep right occipital white matter lesion (asterisk) and a subcortical linear hyperintensity (arrow). B, Coronal T2-weighted image (3500/90/1) in a different patient shows multiple subcortical white matter and right MDJ and pontine lesions (asterisk and arrowheads). A, T2-weighted image (4000/90/2) shows chronic left MDJ lesion (double arrowhead) and ipsilateral lenticulostriatal lesions (arrow). B, Wallerian degeneration of the optic radiation is evident on paraatrial section of the same sequence (double arrowheads). The lesions observed during an acute/subacute episode were surrounded by a more hyperintense rostral and caudal extension on long-TR sequences, which was directly related to the location of the lesion. When located posteriorly at the MDJ, lesions tended to continue downward along the pontine tegmentum and superior cerebellar peduncle, whereas the corticospinal tract was the structure affected in more anteriorly located lesions. In all these lesions with downward extension, the red nucleus was always spared. The upward extension seen with the acute lesions was characterized by involvement of the posterior limb of the internal capsulae, accompanied by involvement of the globus pallidus in four and the putamen and external capsule in three. In lesions of the cervical spinal cord, the bulbar involvement was through extension via sensory long fiber tracts (fasciculus gracilis and cuneatus). The cranial and caudal extensions were found to disappear or decrease in size, leaving a residual lesion on follow-up examinations, as discussed below. These residual lesions were iso- to hypointense on T1-weighted images and slightly hyperintense on proton density–and T2-weighted images, with or without atrophy (Table 2). Serial MR examinations were performed in 23 cases. Of those, 18 were for follow-up purposes, whereas in five the subsequent studies were done because of a relapse or worsening in neurologic status. These MR examinations revealed resolution or decrease in the size of the lesions, 17 of which had shrunk to small areas with nearly total disappearance of the perilesional extension. Sixty patients had nonhemorrhagic lesions while five had hemorrhage (Table 3). Nonhemorrhagic lesions showed prolonged T1 and T2 relaxation times. They were mostly heterogeneous and asymmetric. Of the five patients with hemorrhagic lesions, three were in the subacute phase, as they appeared hyperintense on T1-, proton density–, and T2-weighted sequences, whereas the other two, which were hypointense on all sequences owing to the existence of hemorrhagic degradation products, as previously described, were in the chronic stage (14). In the 11 patients who had contrast-enhanced studies during an acute or subacute phase, nine had nodular enhancement within lesions. Eight of the enhancing lesions were located at the MDJ, corresponding to subacute hemorrhagic foci in three. In one case, the enhancement was confined to the right optic nerve, extending to the prechiasmal border without any other parenchymal involvement (Fig 8). A, Contrast-enhanced coronal T1-weighted image (600/15/1) shows bilateral optic nerve atrophy and marked enhancement of the prechiasmatic segment of the right optic nerve (arrow). B, Contrast enhancement of the nerve disappeared after treatment (asterisk). Currently, the most widely used diagnostic criteria of BD is the International Study Group's classification, which requires recurrent oral ulcerations plus two of the following in order to establish a definite diagnosis: recurrent genital ulcerations, skin or eye lesions, or a positive pathergy test (13). The epidemiology of disease shows geographic variation, encountered more commonly along the Silk Road, which extends from the Mediterranean region to Japan (15). This is coupled with a similar variation in HLA B51 (human leukocyte antigen), which has been reported to be strongly associated with the disease in the high prevalence areas (16–19). Despite broadened clinical understanding of this disease, the etiologic factors remain obscured and speculative: viral agents, immunologic factors, genetic causes, bacterial factors, and fibrinolytic defects have all been implicated (3, 20–25). Vessel wall and perivascular mononuclear cell infiltration, which is consistent with vasculitis involving both arterial and venous systems, has been shown in histopathologic studies (20, 21). It has been postulated that genetic susceptibility together with a possible trigger by an extrinsic factor, such as an infectious agent, is responsible for the observed vasculitis (24, 26). Neurologic involvement in BD, which is not included in the current International Study Group's classification, was first reported in 1941 by Knapp (27), and the term neuro-Behçet syndrome was introduced by Cavara and D'Ermo in 1954 (28). The reported rate of development of neurologic involvement among BD patients ranges from 4% to 49% (9, 29). This rate was found to be 6.7% in our large nonselective series of patients referred from the Behçet's Disease Research Center (30). NBS may present as acute focal or multifocal CNS dysfunction, and the clinical picture of NBS may resemble multiple sclerosis (MS) (7, 31–35). It has been observed that a substantial number of patients with NBS will have a relapsing-remitting course while others may develop a secondary-progressive course; some NBS patients have an insidious onset, with primary-progressive CNS dysfunction, and others may display symptoms attributable to intracranial hypertension associated with dural venous sinus thrombosis (12, 36, 37). Although nonneurologic involvement generally precedes neurologic findings, the nonneurologic involvement may go unrecognized in some cases or it may appear late in the patient's course, thus posing diagnostic difficulties (38–40). Peripheral nerve involvement, although reported in NBS, is relatively uncommon (41). In our study, the most common imaging lesion seen in the acute or subacute stage of NBS was an asymmetric MDJ lesion, similar to previously published reports (7–9, 33). These lesions extended along long fiber tracts and spared the red nucleus, suggesting that this downward extension was due to edema. The reversibility of the extension, leaving small residual lesions at the center, as observed on follow-up MR studies, further supports their edematous nature (Fig 1). This feature was also noted in earlier publications (9, 11, 42). Accordingly, with the exception of the three cases of isolated lesions, pontobulbar involvement was an extension of lesions located at other sites, particularly the MDJ. The distribution and intensity changes of the residual lesions closely corresponded to pathologic descriptions of secondary demyelination (20, 21, 43, 44). In the chronic cases, the intensity changes extended to the cervical cord, along the corticospinal tract, and might be explained by wallerian degeneration (Fig 9). This was noted in some pathologic studies as well (20, 43, 44). A, T2-weighted image (2400/110/2) shows round hyperintense lesion in the posterior and middle third of the right corona radiata (asterisk) associated with rather poorly defined periatrial T2 hyperintensities (arrowheads). B, Coronal T2-weighted image (4000/90/2) shows signal intensity changes along the right corticospinal tract, representative of secondary wallerian degeneration (double arrowheads), along with basal ganglia and pontine lesions (asterisks). The spinal cord involvement tended to extend over two or more vertebral segments posterolaterally and was asymmetric (Fig 5), an observation similar to previous pathologic findings (20, 43, 44). In accordance with that posterolateral involvement, sensory disturbances were the initial symptoms of the patients with spinal cord lesions, in contradistinction to those with upper brain stem involvement, in whom the presenting symptoms were motor in nature. In four cases (6%), an asymmetric subcortical and deep periventricular white matter distribution without cortical involvement was observed (Fig 6). These patients also had concomitant MDJ lesions, and in one case, wallerian degeneration of the optic radiation associated with primary MDJ involvement was detected (Fig 7). In the majority of reported cases with hemispheric involvement, the lesions were located subcortically, particularly within temporal and occipital regions (7–11, 34, 39, 45, 46). The frequency of telencephalic involvement in this study is lower than the rate reported in the literature (7, 8, 10, 44). We can find no explanation for this discrepancy, although it might be attributable to the regional differences of the disease's presentation, as seen with other systemic findings of BD. On the other hand, radiologic and pathologic studies might have different sensitivities, which could also account for this difference (7–10, 21, 34). Another explanation could be related to the fact that the cases reported in the pathologic series were chronic, whereas most of the patients in the present study were imaged during an acute or subacute stage. In most of these pathologic studies, the disease observed included primary as well as secondary changes, such as wallerian degeneration, gliosis, and demyelination (4, 20, 21, 43, 44, 47, 48). There have been only a few autopsy studies performed after an acute episode, and in these the prominent lesions reported were venous thrombosis and secondary parenchymal necrosis (21, 49). Optic neuropathy is a rare finding in NBS (50), and we had a single patient in our series in whom the only MR finding was right optic nerve enhancement (Fig 8). A lesion thought to be of arterial origin was observed in a single patient in whom the lesion within the pons did not cross the midline, consistent with involvement of the penetrating arteries (Fig 3). Although such lesions, resulting from small or medium-sized intracranial arteries, have been reported either microscopically or radiologically in NBS, they are not as common as the arterial lesions observed with the involvement of other systems (20, 21, 40, 43, 47, 48, 50–52). There are also a few publications concerning the involvement of large intracranial arteries (40, 51–53); however, no such involvement was observed in our study. The hemorrhagic lesions seen in our patients most likely resulted from “diapedesis of red cells around veins,” as already reported, and were not of arterial origin (21). Vasculitis is regarded as the key feature in BD (3, 26), as biopsy specimens from mucous and cutaneous lesions show those changes (54, 55). Arterial and venous large vessel involvement, such as narrowing, occlusion, and aneurysmal formation, has been reported in up to 27% to 35% of cases, with 12% arterial and 88% venous (52). An even greater proportion of patients with BD may have small vessel vasculitis, and recently this has been validated as the pathologic basis of various histologic changes observed in different organ systems (26). Autopsy studies and biopsy specimens of the CNS lesions are consistent with vasculitis as well, and they show a clear venous predominance (20, 21, 49) (Fig 10). Radiologic studies support this finding, in that lesions seen in NBS are not compatible with arterial territories. Furthermore, significant perilesional edema with a tendency to disappear or to leave disproportionally small residua on follow-up studies has been reported. This feature is consistent with venous infarction, since not all signal intensity changes seen in venous occlusive disease necessarily represent infarction, but rather an accumulation of water within interstitial spaces (56, 57). This information, together with our observations, supports the probable inflammatory-venous pathogenesis for the CNS lesions seen in BD. Histologic section of NBS shows a totally thrombosed medium-sized venous vessel. Focal fibrinoid necrosis (arrowheads) and moderate amount of lymphocyte and plasma cell infiltration is visible in the vessel wall. At the right side of the vessel, necrotic brain tissue with some newly thrombosed small vessel and mononuclear inflammatory infiltration (mainly lymphocytes and histiocytes) is seen (arrows). On the left, there is severe astrogliosis with some gemistocytic differentiation (H and E, original magnification ×100). fig 11. Schematic representation of the intraaxial venous system of normal parenchyma. Supratentorially, a medullary vein (1) permits bidirectional flow. In the brain stem, especially at the mesencephalic level, intraaxial veno-venous anastomosis (2) is sparse and venous flow is centrifugal, toward the pial veins (pv). ev indicates ependymal vein. If one considers the possible venous territories in which brain stem lesions have occurred in NBS, it is clear that the affected venous structures are indeed small intraaxial veins of the brain stem (58). That particular predilection of occurrence raises the question of why these veins are affected or why occlusion of them causes symptoms. The literature on autopsy studies states no apparent tendency toward these venous channels, and brain stem veins and telencephalic veins are equally affected, although there is a clear-cut predominance of lesions in the brain stem. The question can also be addressed according to regional hemodynamic properties. It is well known that telencephalic structures are drained by superficial and deep venous systems, both of which anastomose via medullary veins (Fig 11). They interconnect superficial pial veins to the internal cerebral vein and the basal vein of Rosenthal, the former being more common than the latter (59), whereas in the brain stem, intraparenchymal radial and longitudinal anastomotic channels are nearly absent (58) (Fig 11). In the spinal cord, intraaxial anastomoses are claimed to be prominent at the thoracic level (60). The particular arrangement of veins in the telencephalon permits them to flow in both directions via medullary veins, as seen with certain disorders, such as deep arteriovenous malformations, Sturge-Weber disease, and the developmental venous anomalies (60), possibly explaining the small diameter and unimportance of parenchymal lesions when such a vein is thrombosed. At the mesencephalic, diencephalic, and pontine levels, thrombosis of small veins might be accompanied by a very large, sometimes hemorrhagic lesion, since there is nearly no collateral venous pathway. The same anatomic arrangement might also explain the vulnerability of the cervical spinal cord (7, 44). It appears, therefore, that the variability of venous anatomic arrangements at different levels of the CNS might explain the predilection of lesions for different regions. Vasculitis, like inflammation in other tissues, is caused by many different agents and pathogenic mechanisms; however, these different causes produce only a limited number of histologic expressions of injury. The major type of injury to nervous tissue in vasculitis is ischemia. Therefore, the same clinical manifestations can result from etiologically and pathogenetically different vasculitic diseases. In vasculitic processes, location, extension, and distribution of vascular involvement might point to a specific diagnosis, such as Takayasu or temporal arteritis (26, 61–65). In NBS, lesions therefore appear secondary to the small vessel vasculitis, and the anatomy of those intraaxial venous structures explains the dominant involvement of the upper brain stem and diencephalic structures. Pathologically proved small vessel arteritis, either alone or with venous inflammation, has also been reported in conjunction with NBS, and it is probable that some of the telencephalic and midbrain lesions might result from small vessel arteritis (62, 63). In our study, there appeared to be at least one lesion that occurred within a probable pontine arterial territory, and the hemispheric lesions seen in NBS were not significantly different from the CNS lesions of other vasculopathies of accepted arteritic origin (Fig 3). Concerning the differential diagnosis, hemispheric white matter lesions are not common in NBS, and when they are present, they are more likely to be subcortical than periventricular. Furthermore, these are generally associated with brain stem–diencephalic lesions. That combination is unlikely in systemic lupus erythematosus (SLE) and non-Behçet vasculitides. CNS involvement due to SLE and other systemic vasculitis tends to involve arterial territories, and as a result, cortical involvement is frequently observed (34, 66, 67). We have not observed cortical involvement in NBS, despite pathologic studies in which such involvement has been reported (21). These changes, however, are minor in NBS, which may explain the radiologic-pathologic discrepancy. Periventricular and ovoid lesions suggestive of MS are not expected to be seen in NBS. Extensive confluent periventricular changes that are seen in MS and occasionally in sarcoidosis were not observed in our patients with NBS. Posterior fossa lesions, particularly those located around the fourth ventricle with or without the associated supratentorial lesions seen in MS, are not similar to the NBS lesions described above. Brain stem lesions in MS are usually small, even in the acute stage, and prominent brain stem and/or cerebellar atrophy without cerebral volume loss, which is observed in the chronic phase of NBS, is unusual in MS (7, 34). When one considers cervical involvement, this rarely extends more than a few vertebral segments in MS (68), unlike the more extensive lesions we observed in NBS. Leptomeningeal contrast enhancement is a typical finding of sarcoidosis (69). We did not encounter this finding in our series; however, contrast-enhanced studies were performed in only 11 patients. Devlin et al (38) reported abnormal leptomeningeal enhancement in two of their patients with NBS. Abnormal meningeal enhancement secondary to dural venous occlusion or to lumber puncture should be excluded before attributing it to the disease itself (70). Inflammatory demyelinating diseases, such as MS, and inflammatory vascular disorders (vasculitides), such as NBS and SLE, can affect the CNS primarily or secondarily, and onset tends to occur in young adulthood. Although the clinical presentation of these diseases may be similar, the radiologic findings of NBS are quite distinct, which may help differentiate it from other disorders, even in the absence of overt systemic involvement. The parenchymal distribution of lesions in NBS seems to support the hypothesis of small vessel vasculitis, mainly venular involvement. The known anatomic arrangement of CNS intraaxial veins explains the predominant involvement of the brain stem structures observed in our patients. This pattern of lesion distribution might help to differentiate NBS from other vasculitides as well as from the inflammatory-demyelinating diseases of the CNS, such as MS. Our experience with NBS has caused us to consider NBS in the differential diagnosis of patients who have brain stem and/or diencephalic lesions that extend along the long tracts and have a tendency to resolve on subsequent imaging studies, whether or not they are associated with periventricular and subcortical lesions. We thank Sait Albayram, Gülgün Atilla, Alp Dinçer, and Büge Öz for help with the manuscript. 1 Address reprint requests to Naci Koçer, MD, Department of Radiology, Cerrahpasa School of Medicine, 34300 Cerrahpasa Istanbul, Turkey. Accepted after revision February 8, 1999.